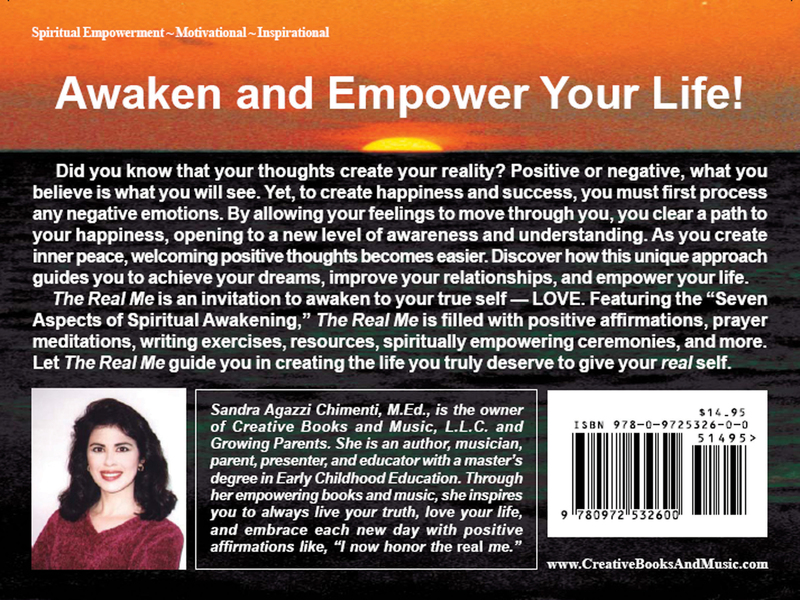 Sandra Agazzi Chimenti, M.Ed., is the owner of Creative Books and Music, L.L.C. and Growing Parents. She is an author, musician, parent, presenter, and educator with a master’s degree in Early Childhood Education. Through her empowering books and music, she inspires you to always live your truth, love your life, and embrace each new day with positive affirmations like, "I now honor the Real Me!" Did you know that your thoughts create your reality? Positive or negative, what you believe is what you will see. Yet, to create happiness and success, you must first process any negative emotions. By allowing your feelings to move through you, you clear a path to your happiness, opening to a new level of awareness and understanding. As you create inner peace, welcoming positive thoughts becomes easier. Discover how this unique approach guides you to achieve your dreams, improve your relationships, and empower your life. The Real Me is an invitation to awaken to your true self — LOVE. Featuring the “Seven Aspects of Spiritual Awakening,” The Real Me is filled with positive affirmations, prayer meditations, writing exercises, resources, spiritually empowering ceremonies, and more. Let The Real Me guide you in creating the life you truly deserve to give your REAL Self.